Hospice is Hospice, Isn't it? Not all hospices are the same. Old Colony Hospice goes above and beyond for patients and their families. Since 1979, we have been providing the highest quality comfort and compassionate care in over 50 cities and towns in Massachusetts. We are a Hospice Honors Elite award recipient and also have been named a Top Place to Work by the Boston Globe. Download “Hospice is Hospice, Isn’t it?”to learn more about why you should choose Old Colony Hospice to care for your patients. 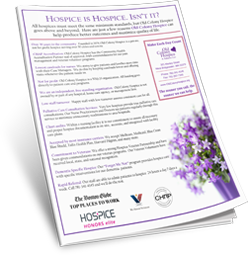 Get the Hospice is Hospice handout today!